For the second giveaway this month, Hijab Style is giving you the chance to win a Kaasni Ruffle Wrap from iLoveModesty! 1. Visit the iLoveModesty website, and subscribe to the newsletter (left hand side bar). 2. 'Like' the iLoveModesty.com Facebook page. 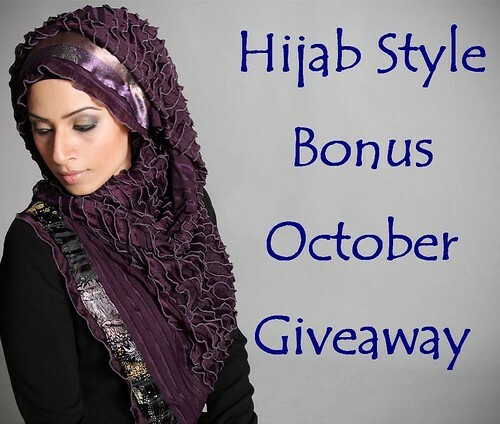 Send an email in with your full name and city with 'Bonus October Giveaway' in the subject line to hijabstyle@hotmail.co.uk. Please note that if any of this information is missing, you will not be entered into the competition. The deadline for entries is midnight GMT on Friday 21st October 2011. The winner will be chosen at random and contacted via e-mail.